.SRT subtitle format created by SubRip program, which uses optical character recognition technology to rip or extract subtitles and their timings from .VOB video files or DVDs. While SSA, abbreviation of SubStation Alpha (or Sub Station Alpha), is another subtitle file format that allows for more advanced subtitles than the conventional SRT and similar formats. Most important, SSA is supported and readable by VirtualDub, an advanced and popular video editing tool, and provides best subtitles quality. Thus occasionally, the following subtitles converters to convert .SRT format to .SSA format will be needed. 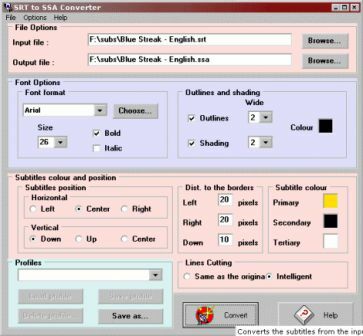 SRT to SSA Converter is a program to convert subtitles from Subrip’s format (SRT) to SSA format, adding subtitles format and colors or other format characteristics. Selected format characteristics will then appear in the program which shows the subtitles. The freeware is available in English and Spanish languages interface. Unpack and run conversor.exe to start the program. Convert SRT to SSA is a free simple tool that converts subtitle files (.srt) into VirtualDub usable subtitle (.ssa). 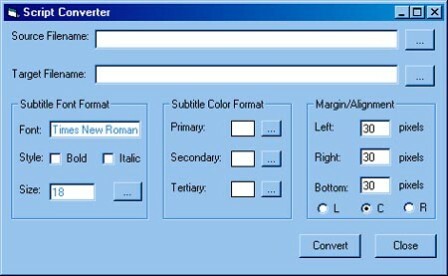 Subtitle Workshop (previously known as DeKSoft Subtitle Workshop) a freeware program for creating, editing or converting subtitle files with complete features. Main features include spell check function and an advanced video preview feature. 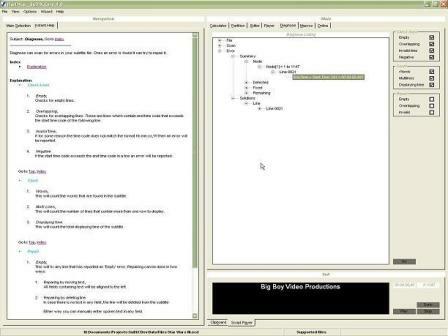 Download Subtitle Workshop from uruworks.net. Simply and free application software to convert Subrip subtitles to SSA format. Download scriptconvert.exe (no longer available). 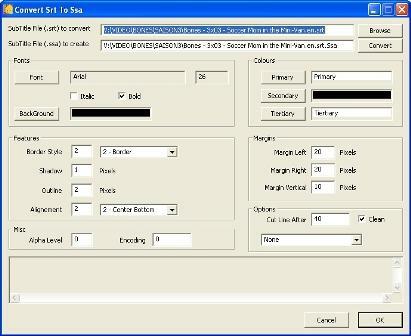 Time Adjuster by ireksoftware.com is a freeware that make subtitles to appear earlier or later, convert subtitle files into other formats, synchronize text with video, join or split subtitle files, repair damaged TXT files downloaded via FTP in BINARY mode, sort lines used time-based technique, and many other features. Download Time Adjuster 3.1 with Help file. SuDiX Core is free app that fix and synchronize any subtitle with ONE single click. SuDix allows users to edit text, synchronize subtitles, split subtitles, merge scripts regardless their format, save script in 16 different formats, download and upload subtitles in any format and language within SuDiX, check and repair damaged scripts. SuDiX is created for beginners (use of Wizards) and advanced users who can create wizards with the use of macro’s. SubConvertor is a subtitle converter that supports srt => ssa, ssa => srt and srt => srt conversion. Both srt formats are supported (frames and times), unlike SRT2SSA program listed above, for example. SubConverter converts the newlines too, keeps the titles, and features framerate conversion and offset (through firstsub) too.